Lacquer Remover Poisoning is the accidental or intentional intake of the compound. The intake may be through swallowing the liquid or inhaling vapors of such compounds. What is Lacquer Remover Poisoning? What are the Causes of Lacquer Remover Poisoning? What are the Signs and Symptoms of Lacquer Remover Poisoning? The signs and symptoms of Lacquer Remover Poisoning can vary from one individual to another. It may be mild in some and severe in others. Several systems of the body, such as the digestive system, respiratory system, vascular system, urinary system, skin and ENT may be affected. How is First Aid administered for Lacquer Remover Poisoning? Who should administer First Aid for Lacquer Remover Poisoning? 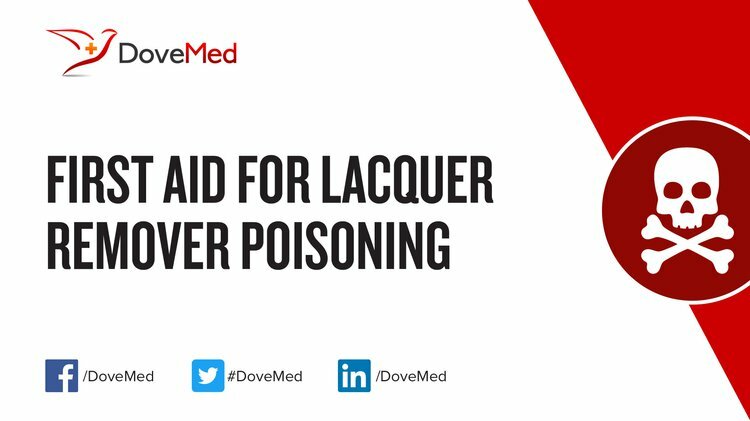 First aid for Lacquer Remover Poisoning is administered by healthcare professionals. What is the Prognosis of Lacquer Remover Poisoning? How can Lacquer Remover Poisoning be Prevented? Singh, R., Vinayagam, S., & Vajifdar, H. (2012). Methemoglobinemia as a result of accidental lacquer thinner poisoning. Indian journal of critical care medicine: peer-reviewed, official publication of Indian Society of Critical Care Medicine, 16(1), 44. Agarwal, C., Mohanpuria, A., Buxi, G., & Kumar, V. (2016). Coincidental Finding of Beta Thalassaemia Minor in a Patient of Lacquer Thinner Poisoning Presenting as Methaemoglobinemia. Journal of clinical and diagnostic research: JCDR, 10(11), ED08. Pacheco, C., Magalhães, R., Fonseca, M., Silveira, P., & Brandão, I. (2016). Accidental intoxication by dichloromethane at work place: Clinical case and literature review. Journal of Acute Medicine, 6(2), 43-45. Neki, N. S., Singh, M., Shah, D. M., Kolhe, K., Bollewar, S., & Bali, M. (2013). METHEMOGLOBINEMIA INDUCED BY LACQUER THINNER INTOXICATION. Journal of Punjab Academy of Forensic Medicine & Toxicology, 13(2), 90-92. Krautheim, A., Lessmann, H., & Geier, J. (2012). Patch testing with patient’s own materials handled at work. In Kanerva's Occupational Dermatology (pp. 919-933). Springer Berlin Heidelberg. An, L., Limei, S., & Dixin, W. (2010). Acute mercury poisoning attributed to Chinese herbal medicine pills containing calomel [J]. Adverse Drug Reactions Journal, 2, 017. Huzar, E., Wodnicka, A., & Dzięcioł, M. (2011). Analysis of Volatile Compounds in Nail Polish Removers as a Criterion of Health Hazard Determination and Commodity Evaluation. Ecological Chemistry and Engineering. A, 18(7), 991-998.